How much would you pay for a good steak? Clearly there are a lot of people out there who are willing to pay a very, very pretty penny, and thus, Rockpool Bar and Grill was born. At Rockpool, cows are treated with reverence. The first thing you notice after entering the demure double doors is a striking portrait of a lavishly well-fed cow, enlarged to noble proportions and duly framed. Before you even get to the end of the long corridor and to the reception desk, you’ll come across a cabinet lit up like a Christmas window, except instead of elves and presents, there are all sorts of cow hung out to be dry aged. And don’t even get me started on the placemats printed with happy bovine enjoying nature. It’s all about the moo here. To the young blonde chef, if you ever read this: you’re super adorable. The intimate corridor opens out to a posh yet cosy room, overlooked by a dramatic open kitchen. A dozen chefs and apprentices work in a frenzy, simmering mussels, grilling steaks over the fire pit, roasting whole chickens, and generally making some awfully delicious smells. After walking past Rockpool millions of times on our Southbank Saunters, we finally find ourselves on the right side of the blinds that hide the restaurant away from prying eyes. With someone to take our coats, pull out our luxuriously deep leather chairs, and even to offer me a black napkin so there won’t be any noticeable lint on my dark jeans, I felt like a princess. Once the ordering was done, our wine glasses were whipped away, and out came the bread and butter. I tried to pace myself, but the thick, crusty sourdough slathered with pale, whipped butter and sprinkled with sea salt flakes was just too much. I seriously contemplated saying yes to seconds when another plate of bread was brought around, but managed to deny it once again. Next time. After perusing the substantial menu for quite a while, Chris started off with a plate of Wood Fire Grilled Baby Octopus, Confit Potato and Hand Pounded Pesto($24). The curls of octopus were an enviable balance chewy and tender, but distinctly lacking in the smoky taste you’d associate with wood-fire grilling. The pesto smeared over the tendrils of octopus was oily and fragrant, its flavours absorbed and reflected by the soft chunks of potato, and accentuated by the kernels of pine nuts. It was a good solid dish without being overwhelming. Rockpool may specialise in beef, but it also keeps well ahead of the game in terms of seafood. And because oysters and I still don’t get along, my choice naturally gravitated towards the Four Raw Tastes of the Sea($34), consisting of premium cuts of kingfish, ocean trout, blue fin tuna, and squid, lightly dressed and delicately served. First up was the kingfish; the dollop of kaffir lime provided an initial wave of flavour that faded surprisingly quickly, leaving behind something almost akin to blandness in its wake. Luckily it was saved by the fish itself, which was so fresh and textured I was half expecting it to swim off my plate. Freshness wasn’t all I found though; halfway through the second piece of sashimi, I came across a bone. This wouldn’t be a huge deal if it weren’t for the fact that I was eating at a two hatted restaurant, where things like this just shouldn’t be happening. The ocean trout was thankfully boneless, the fish silky and buttery, melding harmoniously with the simple grating of lemon on top. The plump tiles of blue fin tuna were a surprise, with an unexpectedly nippy jalapeno dressing topped with ginger slivers and a sprig of coriander. The last raw taste of the sea was a squid ceviche, which has a satisfying almost-crunchiness, topped with an inspired little Mexican salad consisting of three types of peppers, avocado, and red onion, all minutely diced. There was definitely some excellent sashimi on the large square plate, but would I pay $34 for it again? Probably not, especially considering the awful fish bone incident. We pain-steak-ingly (hur.) chose our mains after a lengthy discussion with our waiter on the merits of each cut of beef. They were happy for us to share a couple of steaks, and offered to split them between two plates, which we denied for the entree (because I wanted to take a photo of the whole dish), but gratefully accepted for the beef. The first cut of beef we tried was the David Blackmore Full Blood Wagyu Topside 240g, 34 Days ($49). My god this has ruined all future steaks for me. The flavours were huge and symphonic, beefy and fatty and oh-so-glorious, with a charred exterior anointed with a squeeze of lemon and a just-right daub of sea salt. This may be a secondary cut, but it’s the best piece of meat I have ever had the pleasure of eating. For contrast, our second steak was the Ranger Valley Dry Aged 300 Day Grain Fed Fillet 250g ($69). Whereas the wagyu was robust and beefy with lots of texture to it, this one was buttery and mild, melting in the mouth almost gelatinously. The beef flavours are a lot less prominent, the subtlety a little wasted after the extravagantly flavoured wagyu. Nevertheless, it’s a great cut for people who like their meats tender and delicate. We may have denied the condiment service for our steaks (horseradish, béarnaise, harissa, BBQ, and three types of mustard), preferring to savour the meats without any distractions, but it doesn’t mean we were able to say no to a couple of the tantalising side dishes. Our first choice was a decadent Potato And Cabbage Gratin ($9), served in a shallow pan. The layers of wilted cabbage and potato puree were covered in a devilish bread and parmesan mixture, baked until it’s a burnished gold colour. It’s way, way too much at this point, but it sure was good. Finally learning from all those times where I thought I would be able to handle a burger with double patty and bacon, a side of onion rings, and a milkshake, the Chopped Cos Salad ($9) made for a great refresher. The crispy cos leaves hid squares of sweet capsicum and creamy avocado, evenly tossed in a light lemon vinaigrette. And let’s not forget the brittle croutons scattered on top. 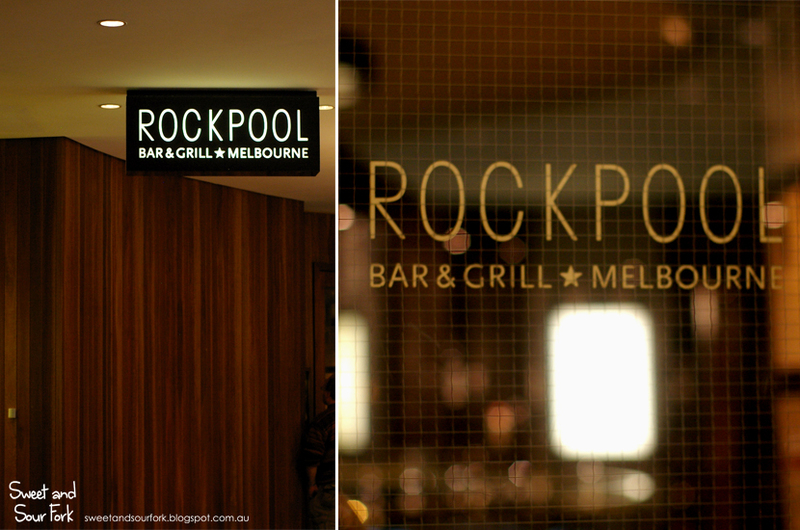 We had a good time at Rockpool; the food isn’t stunning, but the produce is impeccable. No corners were cut, and everything tastes so fresh and alive, right down to the minutely diced capsicum on the squid ceviche. The beef is definitely the star of the show, overshadowing all the other elements of the meal by far. Top that off with impeccable service from impeccably dressed staff, and you’ve got an excellent way to spend your tax return. Love Rockpool - can never go wrong with their steaks, though I find that the $100+ steaks are not necessarily better than their $40-50 steaks, hehe. I love the bread at Rockpool Bar & Grill but I don't like their steaks that come pre-sliced. It just takes the excitement out of slicing my own steak and I think it could be their insurance policy to tell customers it's cooked to their liking. The bread is absolutely fabulous, I personally think the type of bread a restaurant serves says a lot about the food and the care that they put into it. I agree with you on the steak, you'd ideally want to be cutting into a big juicy piece of meat but hey, at least it still tastes the same!